Die clash occurs when the two dies, the reverse and obverse impact each other without a coin planchet between them. It can leave the impression of one of the dies on the other at the low points of the design. 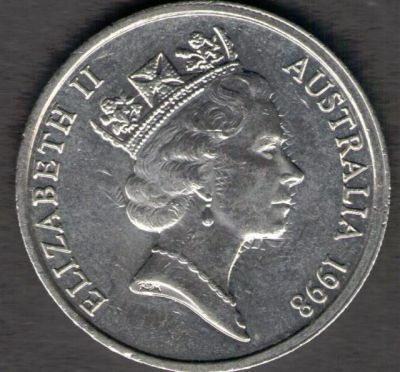 In the case of this 1998 10c particularly in the fields around the portrait and on the lowest point of the portrait design just to the right of Her Majesty’s ear we can see part of the reverse design. This is more easily seen with an overlaid mirror image.